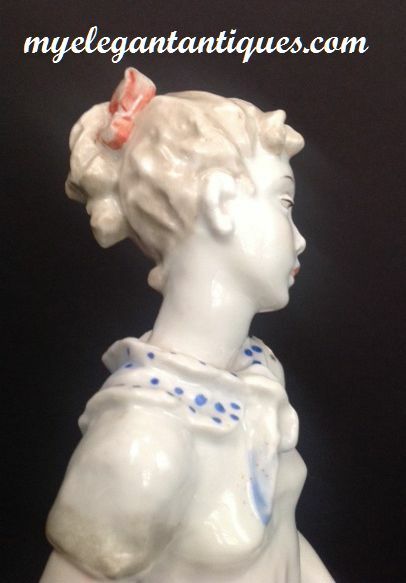 We have a beautiful and rarely seen large Cinderella Rosenthal vintage German porcelain figurine. Designed by Lore Friedrich-Gronau, our Rosenthal Cinderella is reported to have been placed into production between 1950 and 1955. 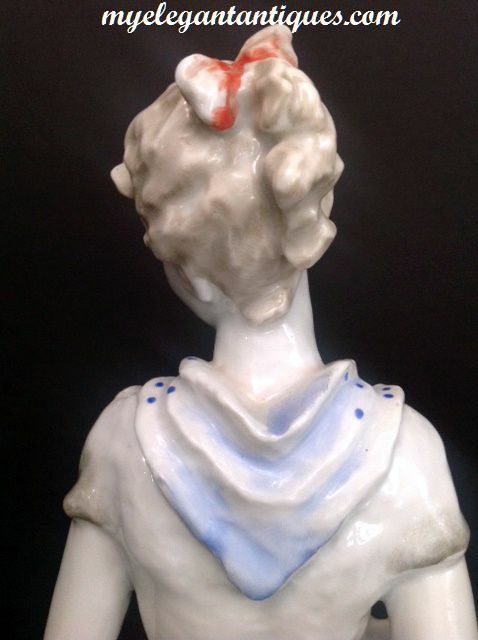 Standing 12-1/4 " in height from the base of the porcelain figurine to the top of her hair bow, Cinderella is perched on an irregular pedestal that measures 2-9/16 " at its widest point. 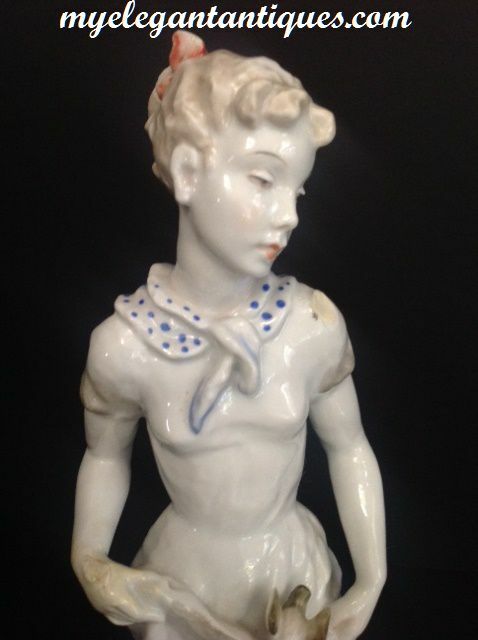 Our vintage porcelain Rosenthal Cinderella figurine has the legend "L FRIEDRICH GRONAU 5014" impressed into her base (see our photographs), as well as the underglaze signature of the Rosenthal art department supervisor . 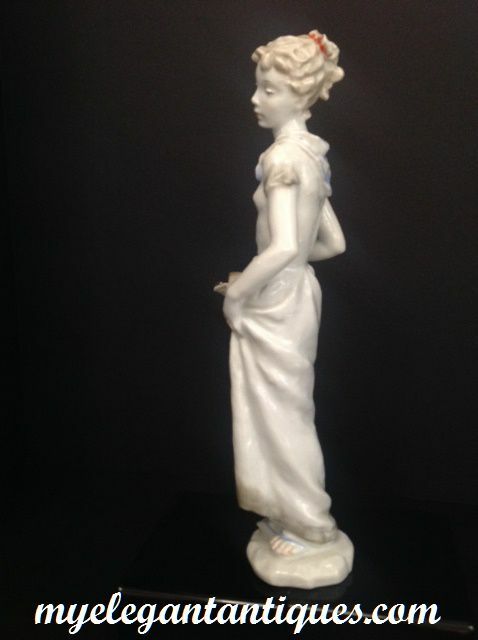 As our photos demonstrate, this lovely porcelain Rosenthal rendering of Cinderella is wistful and contemplative, created in muted tones. 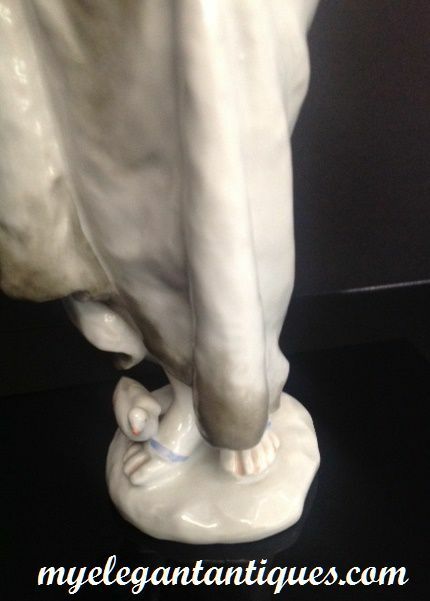 Cinderella cradles a bird which is perched on the pale folds of the skirt she holds, while another bird sits on her delicate foot. 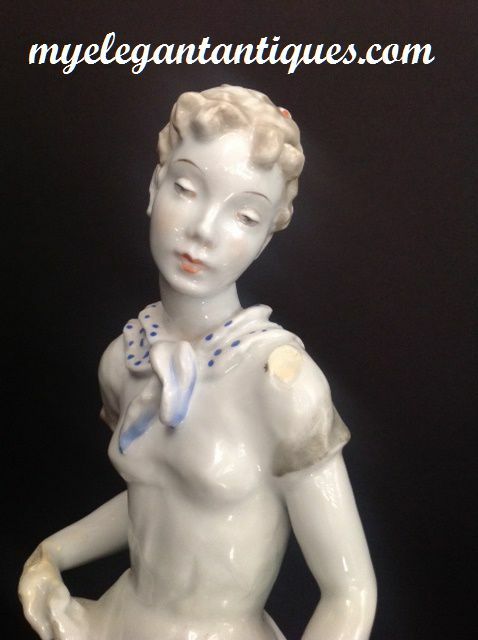 Please note that there is a small area on our vintage figurine's left shoulder and on her right wrist where it is apparent that an object was either knocked off or removed (see our photographs). 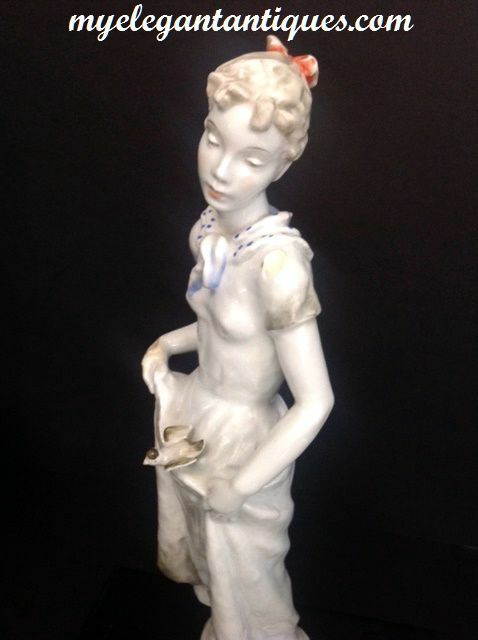 We discuss this situation in detail in our blog posting: we believe that this Mid-Century Rosenthal Cinderella figurine was a production model rather than a mass-produced version of the final mold. 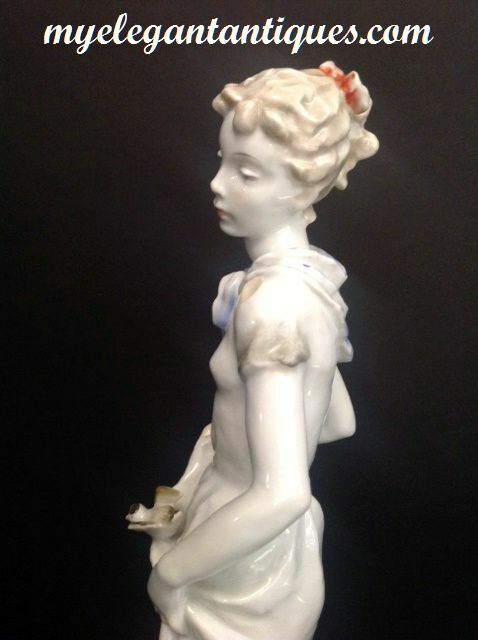 In fact, we are not positive that there ever was a final mold of this Mid-Century Rosenthal Cinderella figurine made for mass production purposes, as it is very hard to find. 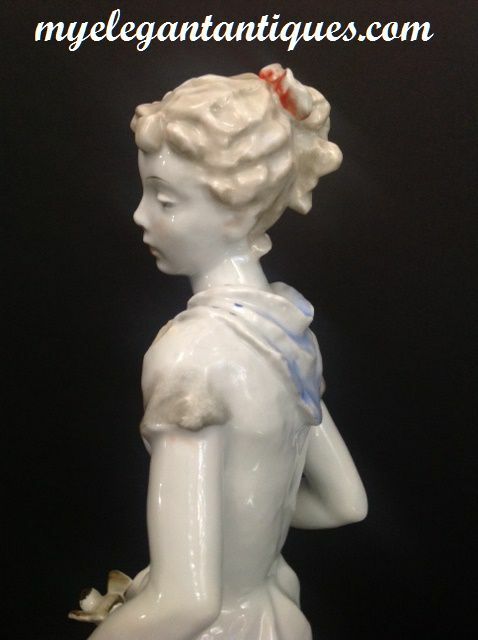 The few photos we have been able to find of other Rosenthal Cinderella figurines that sold at auction (the most recent sale was in October, 2014, on eBay -- 2 or 3 other other auction results were much earlier) show 4 birds affixed to the figurine, including her left shoulder and right wrist. 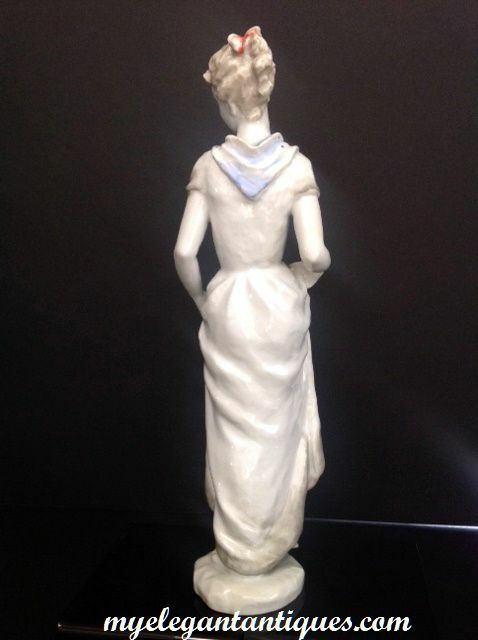 Our lovely porcelain Cinderella figurine is clearly missing two birds, and we are not inclined to restore them because (1) it would be impossible to recreate the actual model with any degree of accuracy, and (2) she doesn't really need them - Cinderella is beautiful just as she is! 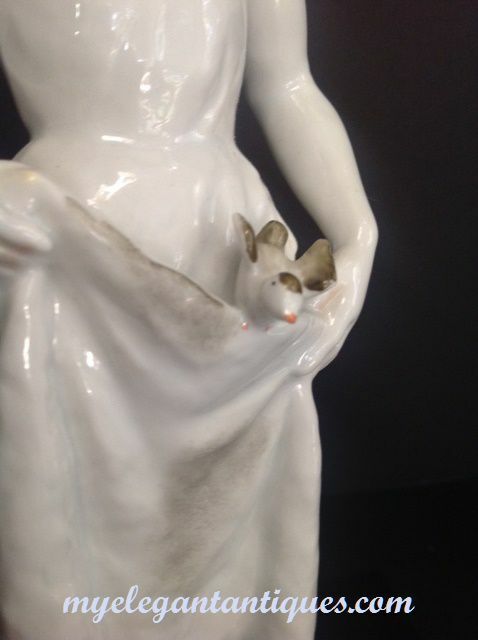 However, rest assured that our beautiful vintage Rosenthal figurine is priced to reflect her missing birds. In every other respect, our vintage Cinderella figurine is perfect, with no glaze crackling, chips, dings or other imperfections. BRIEF HISTORY: Philipp Rosenthal (1855-1937) began his porcelain business in Germany in 1884, initially purchasing white ware from the Hutschenreuther company, which he resold door to door after being hand-painted by his wife, Maria. 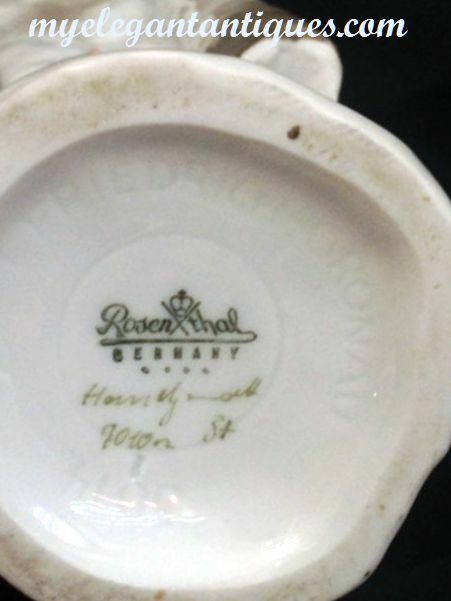 In 1891, Rosenthal established a factory in Asch, Bohemia and began production of his own white ware. From 1897 to 1934, Rosenthal acquired further factories in Kronach, Marktredwitz, Selb, Waldenburg, Sophienthal, and Waldershof. The Marktredwitz factory acquisition in 1908 included acquisition of the brand name Thomas. In 1934 the Rosenthal family came under significant pressure from the growth of German Nationalism. Ultimately, the family was left without any ability to participate in the management of the company. When Philipp Rosenthal left Germany in 1935, his company employed more than 5,000 people in 10 different companies. He died in 1937. At the outbreak of World War II Philip Jr. joined the Scottish Air Force and subsequently the French Foreign Legion and the British Foreign Office. The Rosenthal company continued with limited production throughout World War II, under the auspices of the Third Reich. When World War II ended, Philip Jr. returned to Germany in an attempt to reclaim his family's assets and reassert control over the company. It was a difficult situation, and no resolution was achieved by Phillip Jr. until September, 1950. When he returned to leadership of the Rosenthal company, Philip Jr. successfully modernized out-of-date factories and re-established the company's lost markets, including its former market in the United States. 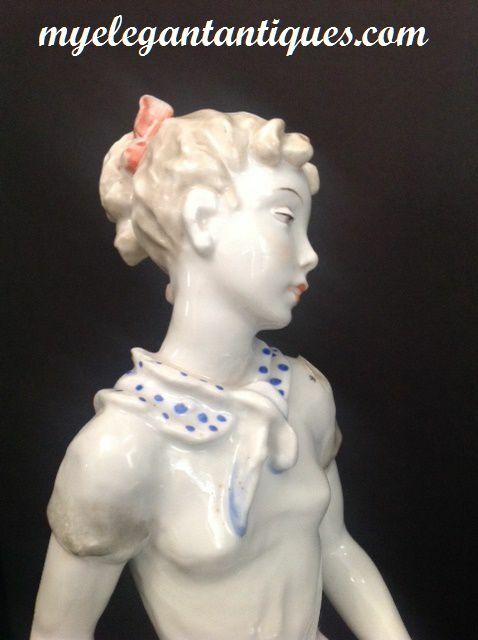 Lore Friedrich-Gronau (1905-2002) was a German sculptress, ceramicist and book illustrator whose works, especially her sculptures, still command high prices at auction. Friedrich-Gronau worked as a free-lance artist for the Rosenthal company from 1937 (the year that Phillip Sr. died) to 1961, and produced more than 40 models for figurines during that time.Friedrich-Gronau’s creations – in particular her dancers – are iconic representations of the Germanic ideals of vitality and physical beauty. She remained in Germany throughout World War II working for the company, until the eventual bombing of her studio forced her to change locations. During the heyday of her time with Rosenthal, Gronau was best known for her exotic dancing figures, which she often modeled from live performers. We meticulously prepare all of our items for shipment. 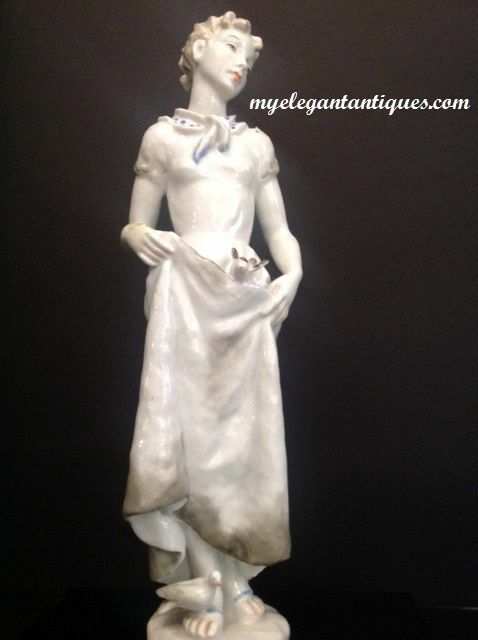 We are offering free shipping on this beautiful and rare Rosenthal Cinderella vintage porcelain figurine by Lore Friedrich-Gronau to our customers who live within the 48 contiguous United States. If you are an international customer, please email us at myantiquarians@myelegantantiques.com with your address so that we can prepare a quote for your shipping costs.